Small footprint digitizer, designed for decentralized CR environments with application-specific plates and cassettes. 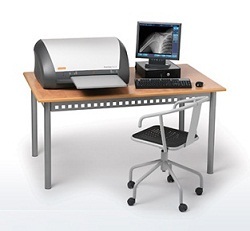 This next-generation CR solution is designed to fit the needs of small to medium-sized healthcare facilities and clinics providing General Radiology, Orthopaedics, Chiropractic, and Podiatry X-Ray services. ImagePilot Sigma delivers a compact and affordable imaging solution that maintains the superior image quality and reliability expected from our REGIUS family of products.Combined with the redesigned ImagePilot software,the Sigma provides simple operation and smooth workflow to a wide range of medical practitioners needing General Radiology, Orthopaedics, Chiropractic, Veterinary, and Podiatry X-Rays. 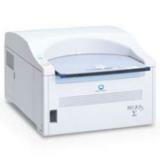 The ImagePilot Sigma is Konica Minolta's smallest and lightest CR. 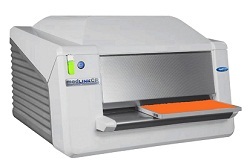 The desktop CR has a footprint of only 0.31m2 and weighs a mere 28kg. The ImagePilot Sigma supports pixel sizes of 87.5μm and 175μm for all cassette sizes, achieving a maximum resolution of 4020x4892 pixels (14x17 at 87.5μm). The ImagePilot Sigma was designed with the environment in mind. Energy consumption has been reduced to 100VA - about the same as a household light bulb. That's one tenth the power of the smallest film processor. Experience the ease of this highly versatile system, capable of efficently handling everyday needs of professionals in veterinary clinics of any size.